If you’re feeling like you’re not a super parent – then you might like to read on. I’m guessing that you haven’t said some of the things I’ve said in the past 16 hours. I’ve complied a list below. Time to get up and finish your assignment (at 5:30) this morning. I’m telling you there are mistakes in this. Your mother, the English teacher, is telling you that you have grammatical errors in your work. You need to listen to me!! It’s not my job to tell you when your assignments are due. Would you please eat while you read? Have you cleaned your teeth? Properly? Show me. Go and clean them properly. Grab two bits of bread and some cheese – that’s your lunch today. You’ve had 10 minutes to decide. No, the iPad grammar correction and spellcheck is not always right. Right now, I’m spending more time on motivating you to do your assignment which is due tomorrow, than I am doing the pile of marking I have to do. I’m going to have to delete the games from your iPad, until the holidays. Yes that includes minecraft. If this assignment was a building you’d designed in minecraft, would you be happy with it? After he went to sleep it continued. I can’t work and mother and keep an eye on assessment. I can’t do it all. Is he ever going to learn to be responsible? I’m not going to bail him out, he needs to learn. But his teachers need to know this! Yep, it’s been a triumphant half day! A fair bit of it stemmed from a conversation I had yesterday with a teacher. My response was fortunately quite circumspect for me. The truth is, I’m not doing his assessment for him. Yes he could get As if I got involved (maybe) but I don’t think that’s my job here. Clearly my transparent face revealed what I thought of the discussion. An apology was forthcoming – and then I felt incredibly bad because I’d made that person feel bad. 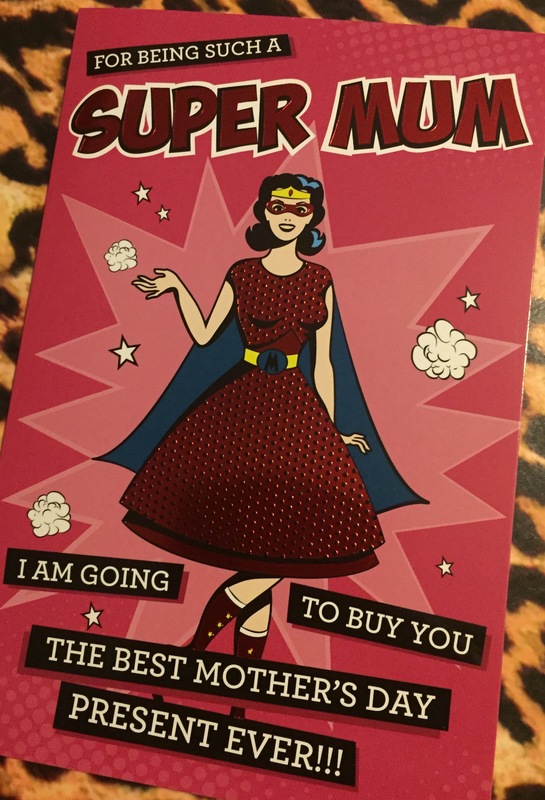 I guess all of this “stuff” compounded to create a day that made me feel so far from the supermum on the card I received earlier this year. The thought of the mother’s card made me feel like a complete fraud. This morning though, I have been reminded of a few things: there is no such thing as a perfect parent, there is no such thing as a perfect child, there is possibly no such thing as a perfect year 7 English assignment – well not in our home. We have only one example of perfect parenting and that comes in the form of our Heavenly Father, the model of patience, longsuffering, kindness, peace, goodness, loving discipline, wise guidance …the list goes on, I’m sure you get my drift. Thankfully for all of us, I’ve married a man who isn’t a perfectionist – which is I guess why he chose to marry me. He is amazingly encouraging when I’m discouraged – which is quite often. He assures me that, one day, the kid who is in the back of the car reading books or solving a rubics cube on the way to school is going to “get it”. In a good sense. It’s going to gel, it’s going to become important. I need to calm down in the meantime and occasionally tell people what I think. I need to recognize that for the majority of this boy’s life I’ve been the only parent trying to teach responsibility, perseverance, the value of quality, the value of education and the value of hard work. And I’m doing it all in my own imperfect way. I am not defined by his successes or failures anymore than I should be by my own. As a teacher, this year I’m less concerned about criteria sheets than I have been in the past, issues with printers I completely understand. Half done drafts are better than non existent drafts, kids who hand in work riddled with mistakes probably did the whole thing themselves, and have probably learnt a valuable lesson either late the night before or in the early hours of the morning. Either way I’m possibly a little bit kinder than I have been, I still want to see the standard rise but … I’m kind of getting a good understanding of why they want me to celebrate when they hand something in. I think I’m actually going to start celebrating! The end note is that I’m going to continue to strive for perfection. But I’m also going to recognize such things are not possible without God. I’m going to pray more and stress less. I’m going to listen more and lecture less. I’m going to trust more and fret less. This entry was posted in Uncategorized and tagged family, parenting, perfectionism. Bookmark the permalink.